When The Moon Tarot Card appears in your reading you can be sure it will be a time of highly charged emotions and confusion. Probably not want you wanted to read! Although, putting aside any fear you possibly have, the reflective light of The Moon Tarot Card will illuminate you way, even in the darkest of times. Should this card appear in your reading then you can be assure that even if the path you are on is a difficult one, everything will be OK. Landing upright and in a favorable position in a your reading, this card is a good omen. If you happen to be involved in a secret affair it often signifies that your secret may be exposed. The Moon Tarot Card can lead to artistic expression through music, art or even writing. This is a great signal as it can lead you to unexpected opportunities. Negatively, this card can mean that you have a lack of progress and generally that is because of a deep rooted fear and defiant anxiety. It can tell of failure of your nerve. Additionally, this tarot card is a strong warning of lies and deceit. You may need to think into this deeper as it is possibly the underlying cause of your worries. Most certainly a card to discuss at more length with your reader! The Moon Tarot is the Pisces of the Tarot deck and the 18th trump of the major arcana in all the traditional tarot decks. It is defined as the card of dreams, intuition, madness, genius, poetry and the unconscious. The card shows the moon, which gets the light from the sun, providing an indistinct and uncertain light into our lives as we walk towards higher consciousness. There is a face in the moon, which looks to be asleep or trying to sleep, symbolizing the human mind. It also symbolizes the need to sometimes look inside for solutions, support and guidance as the consciousness has all the answers. The light from the moon is shown reflecting on a pool of water illuminating a narrow path which symbolizes the subconscious mind. The subconscious mind attempts to help sort out the chaos and problems of the daily life in the conscious mind. The pool shows a crayfish crawling out of the water symbolizing the unconscious human mind which is slowly coming into the early stages of consciousness. 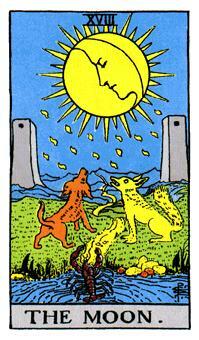 The card shows a dog and a wolf barking at the moon symbolizing the various tamed and wild aspects of the human mind. The howling of the dog and the wolf also represents the everyday demands and expectations that a human mind has to live up to each day. The closed eyes of the face in the moon have also been seen as denoting the willpower and the struggle of the human mind to fight against all odds to maintain its calm amidst this chaos. In the reverse, the howling is also seen as a warning given to the human mind as it begins its unending journey to attain consciousness. The card contains two pillars or towers at a distance from the center in the middle of mountains showing that there is still a great path that the human mind needs to walk to reach the stage of complete consciousness. It distance between the towers also represents the isolation that one goes through on the frightening journey towards the unconscious, leaving all the old worldly ways and the known paths behind. The moon tarot represents the attributes of psychic, reception, anxiety and mysteriousness as the associated astrology sign Pisces. The frequently associated keywords of the cards are Lack of Clarity, Deception, Confusion and Romanticism. It suggests that there is still an unknown mystery in the paths ahead that the faint light cannot reveal. The moon tarot in simple terms denotes two sides – one which is more of a warning of hidden enemies or a possible mental illness and the other which reflects a path of creativity, intuition, powerful magic and pure virtuosity. The card means different things in different positions – upright and reversed. If one gets this card, it could mean that they are going through some difficult emotional time in their life. The card sanctions imagery and fantasy and puts one in touch with visions, creativity and psychic powers. It interprets a feeling of uncertainty, a haunting past, a feeling of being watched and the unsure path of the future. It can also be interpreted with dreamlike state of mind and situations in one’s life. For an individual, the moon tarot comes as a warning of a time of mental trial where the rational decision-making abilities will be put to test. For relationships, the moon tarot signifies beautiful romances, almost dreamlike but yet not trustworthy. Likewise, in case of family it represents a time of major emotional ups and downs. In the upright position, the Moon tarot projects one’s fears from past experiences and its effects into the present and future. It says that the repressed feeling of one’s past, that have remained in the conscious, over time have caused inner instabilities and are slowly becoming overpowering. As a result, they are experiencing negativity in one’s personality. As a remedy to this state, one should undergo a cleansing process to release deep memories. The card predicts that many hidden truths and information can come to light leading to confusion. Hence, one should be aware and be free from one’s past. The moon tarot is also a card of illusion and deception and hence can often suggest that things in one’s life are not as the way they perceive. Hence, observance and clear perception are needed to clear the picture before it is too late. If the moon card is found along with negative reading, it means that everything is as it looks and that forces are at play to bring success shortly. It also gives the famous message that failure is but a stepping stone to success and hence one should not get disheartened and be positive in life. Alternatively, if the moon card is found among with positive readings, it suggests that life is not as bad as it seems and hence one should control their imaginations from running with them. In both scenarios, it suggests that one should not blindly follow their imaginations and understand situations clearly to make timely and accurate judgements. The moon card often appears when one is looking to find one’s future path and not sure of where and how to go. In such cases, it means that one has lost their way, with only the faint moonlight (inner light) and intuition to guide the way forward. It gives the message that one should not let negativity to block their path and should follow their intuition. It asks one to listen to their inner voice and unveil the messages of the unconscious to make the judgements. This will help, not only to clear the path forward, but also to learn lessons which would be helpful in the future journeys. In the reversed position, the moon tarot indicates that one has suffered from self-deception, illusion and anxiety in their recent past, but these negative feeling are now slowly subsiding. It also indicates that some of the deeper emotional issues have surfaced, creating discomfort and turmoil’; and dealing with these inner issues, has made one less fearful and anxious about life. The card suggests that one is beginning to deal with one’s fears and anxieties, understanding the impact of these feeling on life and thus ultimately becoming free from such restraining beliefs. This stage is thus a transformational experience, redeeming oneself from all the inner fears. The moon tarot in its reverse form can also indicate that one is essentially upset about their current situation and also confused between what else can be done and what they really want to do. It shows that one either believes that what they wish to do is naïve and impractical, or could be that their past experiences have made them conclude that this is their final fate, and hence too late as nothing else can be done. Such emotional conditions prevent one from moving on in life. Therefore, they need to be dealt with tactfully to gain positive direction and self-confidence. The card suggests that one needs to believe in oneself to bring balance in life. It suggests that one needs to pay attention to the subtle details and messages of the unconscious that comes to light in such situations. The card also suggests that one is going through a spiritual and intuitive period than usual, but the feelings that one feels may be ambiguous and easily misinterpreted. Often the reversal of the Major Arcana cards such as the moon suggest a need to bring one’s attention and energy within to effectively master the spiritual lesson contained in the card. The Moon tarot thus represents the inner light and the shadow. It brings inspiration, elusiveness, confusion and consciousness all at the same time. It is all about imagination and the power it holds. It mostly suggests the presence of certain risks, secrets and levels of mental confusion in life. It makes one believe that imagination and illusion can be true as well and can be brought to reality. It guides one in the journey of the unknown, with the faint lights of the conscious mind. It also warns to be careful and be cautious of one’s surroundings. It is upon one to interpret it correctly and practice its teaching and readings to achieve success in life. It suggests that though the path is lonely and deserted, what you achieve at the end of the journey is worth the struggle. As the wise say, nothing of worth ever comes easily!